Alaa Basatneh. Photo by Megan Boguszko. It was 2011 when news of the arrest, torture and murder of children in her native Syria snapped Alaa Basatneh out of her comfortable existence in northwest suburban Des Plaines, where she lived with her family while balancing studies at Wilbur Wright College and a busy social life that typically steered her to the mall and movies with friends. “That’s when I said ‘It’s impossible. I’m not going to continue my life having fun, going out with friends, when this is happening to children,” she said. Today, Basatneh, 22, is heralded a revolutionary and credited with saving countless Syrians from her laptop computer, through which she helps to coordinate protests against the regime of Dictator Bashar al-Assad from 6,000 miles away. Since, 2011, more than 6.5 million people have been displaced and more than 200,000 have been killed in clashes with the regime — but Basatneh says the damage would be even greater if it weren’t for the vast global network working around the clock to overthrow Assad. That network and Basatneh’s role in it are the subject of a new documentary, “#chicagoGirl: The Social Network Takes On A Dictator,” scheduled to be shown April 10 at the Wilmette Theater. The film, directed by Joe Piscatella, tells the parallel stories of Basatneh and a few protest leaders in Syria to illustrate how the Internet and social media have enabled people to band together to facilitate change. 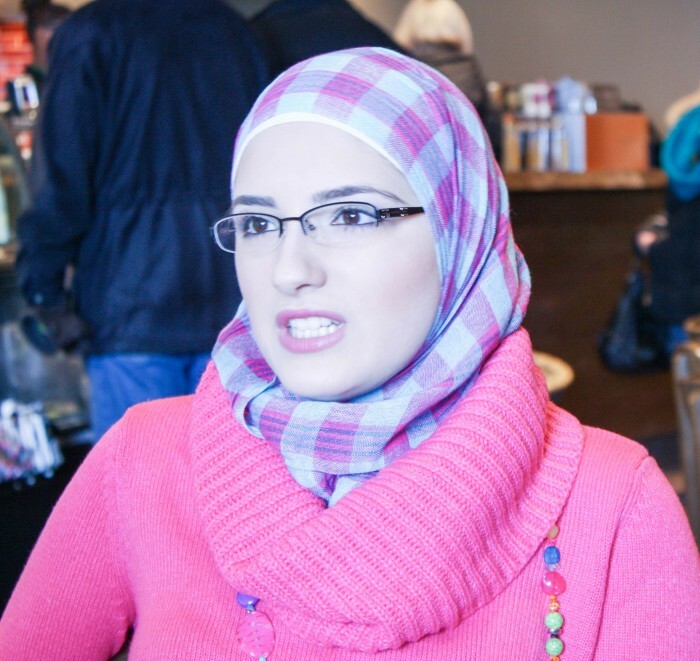 In a meeting at a Starbucks in Niles, Basatneh described her transformation from a typical American teenager to socially aware and active revolutionary. Born in Damascus, Basatneh came to the U.S. with her family when she was seven years old. She said while her family was always one that kept up with events in Syria, the story of a group of ten children, all under 15, who were arrested and tortured in January 2011 in Daraa, Syria, sparked her activism. The children, taking inspiration from the recent revolution in Egypt, wrote “Down with the regime” on their school wall in graffiti. For this, they were burned, sexually abused, tortured and one died. After a couple weeks of still being under arrest, the residents protested to get their children back and the Assad regime opened fire, killing more than 50. She added that although her cause right now is focused in Syria, the fact that women and children are suffering brought her to the fight as much as her ancestry and said she envisions herself working as an activist for others in distress for the rest of her life, wherever they may be. “I want to complete my Masters in International Human Rights and focus on children’s rights, so any region of the world where children are suffering and are going through injustice, I want to help them. I really care about the human aspect of things rather than it being just because it’s Syria. I care about children wherever they are,” Basatneh said. 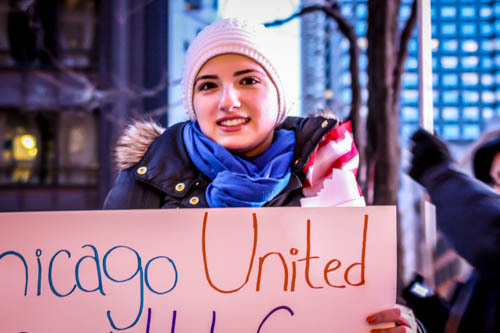 After seeing what happened in Daraa, Basatneh said she initially used social media to connect with Syrian activists to first coordinate a protest in Chicago in March 2011. “I knew I couldn’t be in Syria to help these kids, but I opened my laptop and on Facebook I had less than 60 friends, none of whom were Syrian. 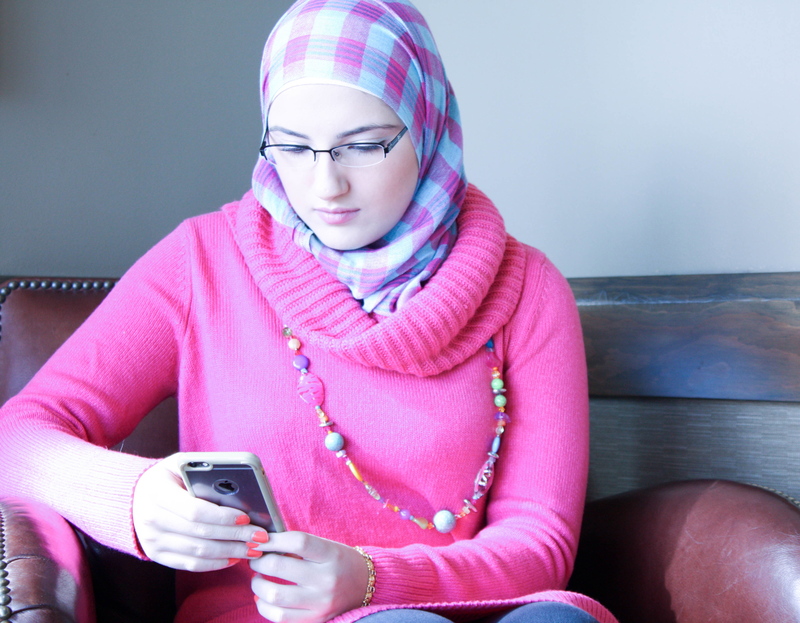 I didn’t know anyone in the Syrian community so I started going to YouTube and looking for activists that were uploading things and I started adding them on Facebook and talking to them on Skype and that’s how the network grew for me,” Basatneh said. “The Syrian community (in Chicago) wanted to do something but didn’t know how, so I created an event page on Facebook and it grew organically. That’s how it started,” Basatneh said. Not long after, she began coordinating protests in Syria. “Activists from Syria would reach out to me and ask me to translate something or would say ‘We are are going to have a 10-person protest in so-and-so’s neighborhood’ and at the same time I’m getting a Skype message saying ’20 people are going to protest here.’ Well, these neighborhoods are very close together, let’s link them and have a 30-person protest,” Basatneh said. Soon after beginning to coordinate protests overseas, one of the leaders was arrested by the Assad regime. Basatneh said he was ordered to open his social media account, and his communication with her tipped off the regime to her role, prompting a death threat. She said although she did believe it was credible, she did not tell her parents at first. “It came to my Facebook account,” Basatneh said. “Around that time, you could count the activists on one hand. They were known and back then they were receiving death threats from the Syrian regime. With the help of other activists, we tracked the IP address to a computer belonging to the Syrian regime. I slept on it for a week and did not tell anyone because I was really scared that my parents were going to tell me to stop everything. Then someone from Amnesty International reached out to me by email, and they asked if I knew anyone in the expatriate community who was threatened by the regime. I thought it was a sign from God, that I can’t hide this anymore. So when I emailed her back the screen shots and the details, that’s when I had to tell my parents. My dad called the FBI right away and just talking to them, I felt safe,” Basatneh said. Because of the threat, officials at Wilbur Wright College had security assigned to Basatneh. “It was for less than two weeks. I stopped it because I felt like it was too much,” Basatneh said. “Females my age were being detained and tortured in Syria. I felt like I was betraying them by having security walk me back and forth in Chicago, in the United States, around my campus. It’s not right. They are the ones who should have security, not me,” she said. In late 2010 and into the spring of 2011, Piscatella watched from his Los Angeles home what became known as the “Arab Spring.” First, in Tunisia, revolution was started after Mohammed Bouazizi, a 26-year-old fruit vendor was hassled by police, causing him to hit a breaking point. He doused himself in flammable liquid and set himself afire. Protests in support of Bouazizi were video taped by his cousin and went viral on social media after Al Jazeera broadcast it to the world. In large part because of social media, 54 years of dictatorship in Tunisia, including 20 years of dictator Ben Ali, was gone in 28 days. Then in Egypt, a marketing executive named Wael Ghonim sparked a revolution after creating a Facebook page dedicated to a victim of police brutality and murder. Hosni Mubarak, leader of the third-longest dictatorship in Egypt’s 6000-year history was out in 18 days. Piscatella said the Internet and social media angle really caught his interest, and when he read a short article in the Chicago Tribune in October 2011 about Basatneh being threatened, he reached out to her. Piscatella said the first time he spoke to Basatneh, he focused on the threat against her but was quickly told that it was only a small part of a much more important story. “She said it was scary but that it was such a small part of a much bigger thing that she was doing. She explained that she was coordinating protests in Syria and the way she said it, it was so matter-of-fact. It was very much a millennial attitude, like ‘Of course I’m doing this, isn’t everyone?’ I thought if she wasn’t making it up, she must be exaggerating what her role was. But it was compelling enough that two days later, my producer Mark Rhinehart and I flew to Chicago to meet with her and her family. We saw that she wasn’t making it up, she wasn’t embellishing. She had a role and is involved in the Syrian revolution. You have journalists and medics, doctors and protest coordinators on the ground in Syria. She just happens to be a coordinator who is an expatriate who can do some things that they can’t do from Syria,” Piscatella said. Basatneh said she agreed to take part in Piscatella’s documentary so that future generations can see what it took to bring democracy to Syria and was not concerned about the film making her a larger target than she already was. “The reason I said yes to this documentary is that I want the sons and daughters of the martyrs to see this documentary and say ‘Look what our parents went through to achieve a democratic country in Syria.’ I didn’t think about becoming a larger target because regardless, my picture is on Facebook and other social media, my full name, everyone knows where my family is in Damascus, there is nothing more for them to see,” Basatneh said. Viewers get to know Shadade and fellow activists Mazar “Omar” Tayara, an engineering and architecture major from Homs, Syria; and dental student Aous al Mubarak, from Damascus. Shadade filmed most of what the viewer sees in the film from Syria, while Piscatella focused on Basatneh in Des Plaines. From start to finish the film took three years to make, two years of which were taken up by filming. Piscatella said over the course of making the film, getting the footage out of Syria was one of the biggest challenges. Not only has she helped her friends in Syria from her laptop, but she has brought much-needed medical supplies to Syria twice, each time crossing a minefield to return to her homeland and bring help. In addition, while the fight for democracy rages on, she has also spread awareness in the U.S. to other issues affecting Muslims, especially those involving women and children. Perhaps the most vital task Basatneh provides her fellow protesters with is security. She explained that before a protest, she would have the social media logins and passwords of the protest leaders and would delete their accounts in the event that they were arrested by the Assad regime. Doing this protects those in the network and those who the leaders had been communicating with, Basatneh explained. And because the Syria time zone is 8 hours ahead of Chicago, it would often infringe on her sleep and studies. “It’s very vital, that’s why I would try not to sleep at night. In case someone would contact me to deactivate someone’s account, it needs to be done quick because the minute the Syrian regime detains someone, the first thing they demand is your passwords and your Facebook login information,” Basatneh said. Patrick Hilsman, a freelance journalist who was most recently in Syria last week, responded to questions via Skype from Turkey, saying that Basatneh’s service to the protesters is of the utmost importance. Alla Basatneh checks updates from Syria on her phone. Photo by Megan Boguszko. In addition to protecting the protesters, Basatneh disseminates videos from protesters who are citizen journalists on the ground in Syria, letting the rest of the world know what is going on. This is also vital because since March 2011, Syria has banned foreign journalists from covering the events. All but a small group has been allowed there since, making covering the story a challenge. One of the main things the protesters on the ground do is record everything, and then upload it to YouTube, often in several pieces because of slow connection speeds in Syria. Basatneh then downloads it, the protesters in Syria delete it, and Basatneh distributes it to the media in the west. “It’s very hard to upload in Syria, it takes like 30 files for a 10-minute interview,” Piscatella said. Hilsman said that along with the Syrian ban on foreign journalists, the danger has kept a lot of reporters out. “It’s a tricky situation for journalists in general because most media companies don’t want to get behind any type of reporting from inside Syria because obviously it’s a liability for them. The vast majority of reporting within the country is coming from freelancers like myself, and it presents a difficulty because there are very few who can support themselves from journalism right now. To make money, I work at a cafe,” Hilsman said. Jackie Spinner, a former Washington Post correspondent who covered foreign conflicts in places such as Iraq and Afghanistan, said that citizen journalists are essential, and that Basatneh’s knowledge of who the protesters are helps to ensure the story is accurate. “There’s a reason why the news organization are not allowing their correspondents to go. It has to do with liability, but it also has to do with extreme risk. Syria is the most dangerous place in the world right now to be a journalist. Whether you’re a western journalist or a Syrian journalist, it’s extremely dangerous,” Spinner said. “Social media is unfiltered and so as people go to social media to get information, they don’t always know where it’s coming from or whether or not it’s propaganda,” Spinner said. “As a journalist, I respect citizen journalism. They are able to provide eyewitness accounts in places where very few journalists are able to go right now, particularly in Syria. There is a danger that because we (the press) are not able to vet, we are not able to determine its authenticity. I think she (Basatneh) plays an important role in helping to vet for accuracy because she knows the players,” Spinner said. Currently, there are about 20 journalists missing in Syria, according to the U.S.-based Committee to Protect Journalists. By 2012, things had evolved to the point where Basatneh decided to leave her laptop to return to Syria with her father in May and October 2012 to bring medical supplies and computer equipment. Though she had only visited the liberated areas of the country, she could not take any chances by attempting to cross into the country through a Syrian border checkpoint. She flew from Chicago to Istanbul, and then to the south of Turkey before crossing a minefield to enter the country. “The places I reached were the liberated areas. There was no ISIS then and the regime had no control over the areas I visited,” Basatneh said. “I remember talking to someone in the State Department and he was telling me that Assad lost control of 60 percent of the Syrian border, so I felt like I could do this. I couldn’t enter through the regular borders in case someone from the regime was there, so the activists and I had to cross a minefield between south Turkey and Syria. Before going, Basatneh eased the fears of her family by reminding them that they believe in fate. Four years after the first protests, there are many reasons why the Assad regime hasn’t fallen quickly like in Tunisia and Egypt. According to Eric Schmitt of the New York Times, who has covered the uprisings, Assad benefitted from seeing how the dictators in nearby countries fell and also has some powerful allies. Hilsman added that despite popular belief, the U.S. has not provided adequate equipment to the Syrian opposition. Basatneh also criticized the lack of international support, especially from the Arab nations. As for the protests, Basatneh said the opposition can be better organized and ideally would have a leader. “Every time the activists on the ground in Syria join together and vote for a leader, the next day he’s murdered,” Basatneh said. Another reason for the failure of the Syrian uprising to oust Assad thus far may also be the lack of action from the middle class in Syria, something that both Piscatella and Basatneh noted. Asked about her own family in Damascus, Basatneh said it’s hard for her to know what they think because they live in a regime-controlled area where communication is monitored. “I have cousins in Syria that upset me. The fact that they don’t say anything or do anything, meanwhile, just outside their city, more people are dying than ever,” Basatneh said. Asked if she knows how her relatives feel about the revolution, she said, “I don’t know what they think because they don’t talk politics to me at all. They don’t talk about the Syrian revolution at all because everything is monitored, because they are in a regime-controlled area. They are a minority now, people who have not lost anything and have some sort of income coming in. They don’t want to say anything, they don’t want to get involved. They aren’t doing any justice to the people who are dying right outside their city however,” Basatneh said. She added that while her activities may put her family in Syria in danger, she considers everyone in Syria to be in danger. Basatneh also remains committed to anti-violence and admits that while she and other protesters sometimes get discouraged that the Assad regime still remains, it is essential to keep the faith. “I believe that democracy comes from within for Syria. If you hold a weapon, you’re just adding to the problem, you’re not solving the problem,” Basatneh said. According to freelance journalist Simon Speakman Cordall, who has covered the protests in Syria and the rise of the Islamic State (ISIS), ISIS was in large part created as a result of Assad in 2011 releasing from his jails those who would become ISIS leaders in a strategic attempt to take the world’s attention off of his atrocities. While ISIS is no doubt a story, the crimes committed by the Assad regime go on, Speakman Cordall said. “Despite the intense media focus on the warring parties of Syria, not least ISIS, life for many under the Syrian regime remains a miserable affair,” Speakman Cordall said. Hilsman agreed, calling the emergence of ISIS a “A godsend for Assad” and adding that they are another threat to the protesters seeking democracy. “If you go to that country, it’s painfully obvious that there is a deliberate strategy on behalf of the regime to pick off moderate opposition and sort of let ISIS do its thing. It’s totally relevant that ISIS has killed more members of the opposition than of the regime. They are truly despised within the country, as is the Assad regime. It’s tremendously obvious that this was a part of the strategy from the get-go. A lot of the people in ISIS are people that Assad released from prison at the very beginning of the uprising,” Hilsman said. Andrew Tabler, a Syria specialist at the Washington Institute for Near East Policy, pointed out in an email that the current media attention on ISIS has allowed the Assad regime to continue its reign of terror more easily. “The regime has committed many more atrocities than ISIS to date – but the latter’s targeting and promotion of grim execution videos has put the group in the spotlight,” Tabler said. Basatneh said that both ISIS and the Assad regime are benefitting each other and because of the media attention that ISIS is taking from the protesters, they are having to double their efforts lately. She also said that it’s vital for Muslims in America to educate the public and battle misconceptions. “I blame the extreme groups that have been portraying the Muslim religion and the culture in a very horrible way and I feel that Muslims should be standing on the streets with flowers, they should be standing on the streets with flyers, showing and raising awareness to the community of what it means to be a Muslim, what it means to be an Arab. We are part of society, we are trying to help and not cause fear or terrorize,” Basatneh said. 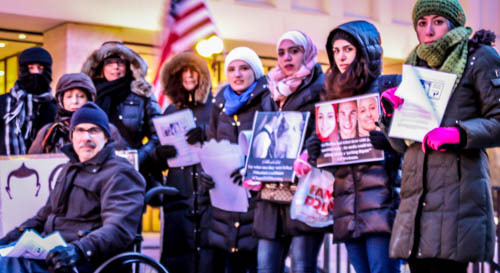 Along with helping the Syrian revolution, Basatneh also helps bring awareness to Muslim causes in the U.S., such as leading a recent demonstration in Chicago to denounce the murders of three Muslims in North Carolina. In addition, she is working for a public school in Chicago, helping Muslim refugees learn English and get assimilated. Alaa Basatneh (center) and supporters at a recent downtown Chicago vigil to remember three Muslims killed in North Carolina. Photo by Megan Boguszko. Piscatella said that one of the most gratifying elements of the film is the realization from the audience, especially high school and college students, like Basatneh, want to make a difference in their own lives. “We get hundreds of messages, a lot from the millennial generation. The messages we get say ‘Alaa and Bassel have shown me that I can make a difference in my own world with the tools that I use everyday.’ As a filmmaker, that’s really gratifying,” Piscatella said. Basatneh said while she has spoken several times with State Department officials, they did not encourage or discourage her actions over the last few years. “It wasn’t anything official, but I knew people that worked for Ambassador (Robert) Ford. After the revolution started, the U.S. withdrew him and his people from Syria and sent them back to D.C. They would contact me and ask me ‘Who’s in this new group, what do you know about them? '” Basatneh said. Ford, now a Senior Fellow at the Middle East Institute in Washington, D.C., said by phone that the situation is one that probably cannot be resolved with protests alone and criticized the U.S.’s role. Basatneh said right now, almost four years since the start of the revolution, it is hard to predict when it will end. #chicagoGirl makes its Chicago area premiere 7:30 p.m. Friday, April 10 at the Wilmette Theatre. Alaa Basatneh will be there for a reception and q&a following the film. For information, click here.